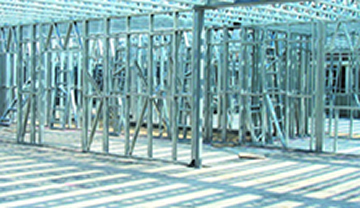 We supply and install light weight Steel framing which is the revolutionary form of erecting buidlings on a fast track system. 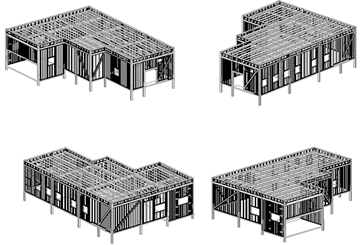 This system is ideal for the erection of internal walls changing warehouses into appartments. 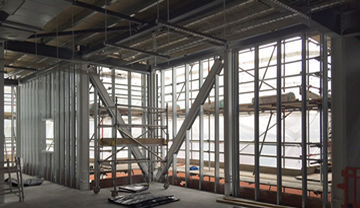 Stud and Track infill within Hot rolled steel for an extension to the hospital main building. Moore Construction installed 10mm Trespa Meteon using a TS200 system on the schools new sports facility. Moore Construction installed Prodema and Trespa panels using sika adheshive fixed to a T & L rail system. Moores also installed Stainless Steel mirrored panels which were glue fixed to an Aluminium sub frame. 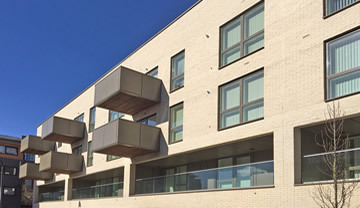 We installed 3mm PPC aluminium ipc interlocking planks fitted to aluminium support system. Was 3mm PPC aluminium TFC rainscreen panels fitted to aluminium support system. 2mm PPC aluminium TFC rainscreen panels. 2mm PPC aluminium flat panels. 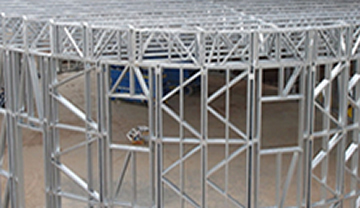 Fitted to a aluminium support system.